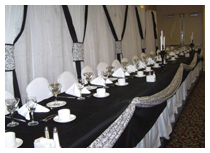 Wedding and Event Decorating - Fenelon Falls, - Big Event Floral & Decorating Co.
Do you need professional assistance in planning and decorating for an upcoming Wedding, Party or Corporate Event? Meredith Montgomery is a professional, reliable and experienced Floral & Decorating Consultant. She will put as much care and detail into every aspect of your event as she would if it were her own event. For the Perfect Wedding Decor, Big Event Floral can provide Bridal Bouquets, Flowers to Wear, Cake Flowers, Centerpieces, Garlands and Pew Markers. 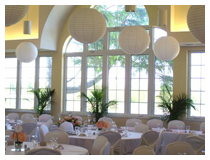 Big Event Floral & Decorating Company offers full event decorating services including: Fresh Flower Arrangements & Accents, Backdrops, Lantern Ceiling Displays, Candelabras, Decorated Arches, Columns, Linen Rentals, Chair Covers and Table Skirting.